Watermane is a 34 year old woman. She is 5'8" tall, has long blue hair, and has blue eyes, including unusual iris' in each eye which are light blue in color. 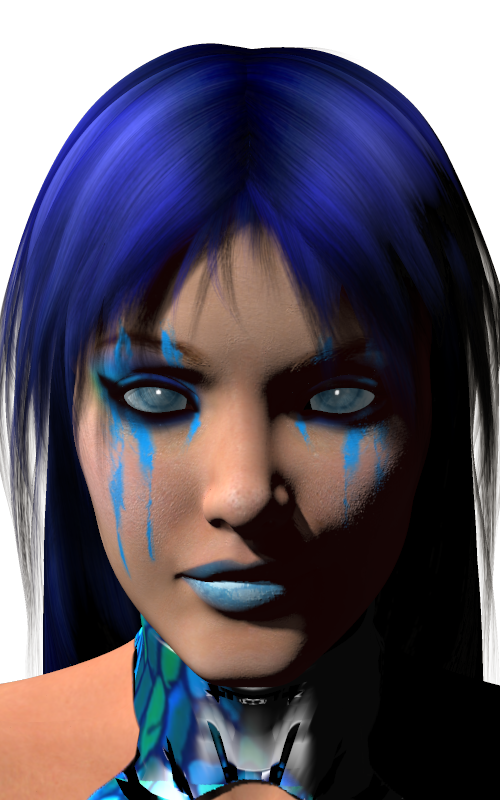 Her face also has blue tattoos, although it is not known if this is something she does for H.E.R.O. activities or if they are permanent. She has been a member of H.E.R.O. for approximately eleven years. Watermane is currently classified as a blaster with water powers, although some believe she ought to be listed along with Muckman in an elemental category. She is capable of turning her body into living, moving water - she retains her body shape in this form, and her costume stays over it. She can also turn portions of her body into water, such as a hand only. She can blast streams of water from her hands, and when near other sources of water she can cause the water to move at her direction - including causing it to rise up into shapes or snakelike forms to splash or strike in combat. In other respects she is similar to a blaster, lifting approximately half a ton and sprinting up to 30 mph. She can swim at least 60 mph. Watermane stays along the River District in Metrocity to maximize her movement speed to events and to best utilize her powers. She is a core reason the city is known for having one of the best beaches in the central United States, due to the clean state of the river and beach. She has no special weaknesses, although some attacks do very little (if any) damage to her in her watery form. She wears a costume that mostly appears to be a swimsuit with blue and green scales on it, along with a pair of bracers, and sandals with straps to allow her to move easily on both land and water. She has both martial arts training and first aid training, although in combat she prefers using water attacks. Watermane first appeared in H.E.R.O. - Dark Research.